About 1.1 million health insurance exchange customers have dropped their 2018 coverage as of mid-March, according to CMS data released Monday. Still, more exchange enrollees paid their first-month premiums in 2018 than in 2017, despite fewer sign-ups during open enrollment. Of the nearly 11.8 million people who signed up for 2018 coverage through the federal and state health insurance exchanges, a little more than 10.6 million paid their premiums for the first month and had an active policy as of February 2018. 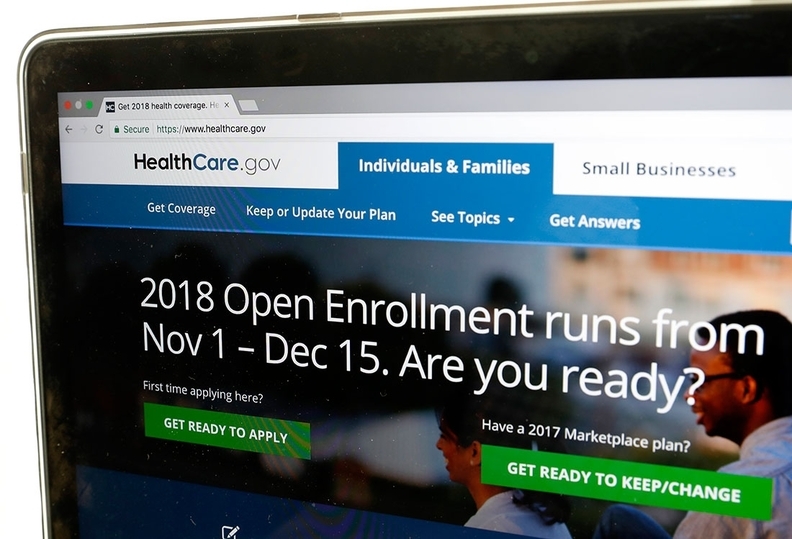 The rest—about 9%, or 1.1 million people—who chose a plan or were automatically enrolled during open enrollment did not pay first-month premiums and dropped off the insurance rolls. The number of people who paid their premiums was slightly higher in 2018 than in 2017, despite fewer people signing up for coverage this year. About 10.3 million people out of 12.2 million who signed up for a 2017 exchange plan paid their premiums for the first month of coverage. There could be a few reasons more people held onto their insurance plans this year. The average federal premium tax subsidy increased in 2018, so many Obamacare customers were able to find plans with zero or very low-cost premiums, said Matt Fiedler, an economist with the Brookings Institution. It could also be a timing quirk, he said. The Trump administration shortened the open enrollment period for 2018 coverage to end on Dec. 15 with coverage beginning in January. In previous years, open enrollment had ended on Jan. 31 with many health plans effective at the start of February or March. Because the CMS data focuses on enrollees with an active policy as of February, the agency's 2017 data would not have captured those members with coverage starting in March. As was the case in prior years, more enrollees are likely to drop coverage throughout the year. The CMS said 8.9 million people remained in exchange plans by the end of 2017. Most of those who drop exchange coverage do so because they are instead enrolled in a health plan through their employer, Medicare or Medicaid. The percentage of enrollees who receive financial assistance to pay for premiums rose in 2018 to 87%, compared with 84% in 2017. About 9.2 million of those still enrolled in 2018 coverage receive an advance premium tax credit to help subsidize the cost of monthly premiums. The tax credits are available to people with incomes between 100% and 400% of the federal poverty level. Meanwhile, about 5.6 million, or 53%, of enrollees received a cost-sharing reduction subsidy available to those who make less than 250% of the poverty level and enrolled in a silver plan. Even though the Trump administration ended the cost-sharing reduction payments late last year, insurers are still required to lower the deductibles and copayments for eligible members. The CMS also said enrollees paid an average monthly premium of $597 in February before taking into account tax credits—an increase of 27% over the average premium in 2017. The average tax credit totaled $520 per month, up 39% over the size of the credit in 2017. The size of tax credits available to eligible enrollees spiked in 2018 because of the way state regulators and health insurers handled the federal government's decision to end cost-sharing payments. Insurers in many states loaded a surcharge attributable to the lost cost-sharing reductions into silver plan premiums, which subsequently increased the amount of the federal premium tax credit available for most enrollees. Some exchange shoppers were able to find zero-premium bronze plans or lower-cost gold plans as a result. Still, enrollees who weren't eligible for financial assistance were forced to stomach large premium increases. Another report released Monday by the CMS compared enrollment among subsidized and unsubsidized members enrolled in coverage through the individual market both on and off the exchanges. Only people who enroll in coverage through the exchange are eligible for a premium tax credit. Unsurprisingly, the CMS found that most of the people who dropped their insurance between 2016 and 2017 did not receive premium tax credits to subsidize the cost of their monthly premiums. According to the agency, the average monthly enrollment among unsubsidized members declined by 1.3 million, or 20% from 2016 to 2017, while enrollment among those receiving premium tax credits decreased just 3%, or 223,000 members. Average monthly premiums in 2017 increased 21% over 2016. In 2017, an average of 13 million people were enrolled in coverage through the individual market, compared with 14.5 million in 2016.